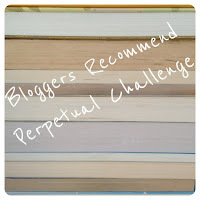 Blogger Recommend Challenge – October 2013 – my books. my life. October is here. The weather is cooling down, people are going pumpkin-spice crazy, and the new releases are still rolling in. The October Bloggers Recommend Newsletter should have shown up in your inbox yesterday, but you can also check it out here. A few of you posted reviews in September. Becky at No More Grumpy Bookseller loved The Coldest Girl in Coldtown by Holly Black. Anita from Anita Loves Books definitely gets a gold star; she reviewed TWO books: My Mother’s Secret and Margot. And Marg at The Adventures of an Intrepid Reader just barely squeezed in a September review yesterday with Songs of Willow Frost. I know a lot of you – myself included – are still working on those September books. I expect to see more people linking up reviews as we go along. Just link up any review you post in October here, whether it’s from the October newsletter or not. I think that will be the simplest way to keep up with them. As for my October read, I am definitely looking at the new Mira Grant book, Parasite. What book(s) are you planning on reading? Also, we need a twitter hashtag, but everything I think of is too long or not very descriptive. Thoughts? I’m going to read Libba Bray’s The Diviners I hope! Going to read THIS HOUSE IS HAUNTED and THE LAST WINTER OF DANI LANCING. Maybe one more. I know! 600+ page books scare me these days. I think it would take me 3 months to read one. At best. Jeez, I can’t even get my link right. *consistency challenged* I did both of the books as a two-fer review since it seemed to make more sense that way, hence the listing of both in the link.